ROLEMODELS GIVEAWAY! : 4 Card Games! EDIT 10.21.13 : THANKS TO EVERYONE THAT HELPED SPREAD THE WORD! We'll be announcing the winners of our giveaway momentarily! Stay tuned for some more great ROLEMODELS content on the blog! 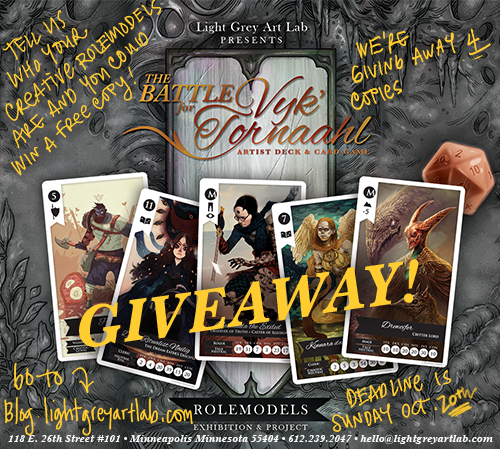 We're hosting a pretty darn big GIVEAWAY in celebration of the ROLEMODELS exhibition and the release of the Battle for Vyk' Tornaahl card game inspired by the heroes, kingdoms and lore within! We need your help spreading the word about this month's ROLEMODELS festivities - and finding out who your own role models are! And in exchange for your kind generosity, we'll reward you with riches beyond your wildest dreams! We'll be having the biggest, craziest party ever for the Rolemodels opening reception on Friday, October 25th! A celebration fit with Flagons of Mead, Costumes Galore, and Standard-Bearers for the four kingdoms of Vyk' Torhaahl! You can get your photo taken alongside the heroes and lands or learn to play the card game alongside your allies and foes! Come see the RPG alter-egos of our creative role models - along their stats, their allies - and get to know them through their choices of class, alignment, statistics and lore. Make sure to get your costumes ready, as we'll be having costume contests throughout the night for more chances to win the Battle for Vyk' Tornaahl Card Game! What better way to spend your Halloween weekend! 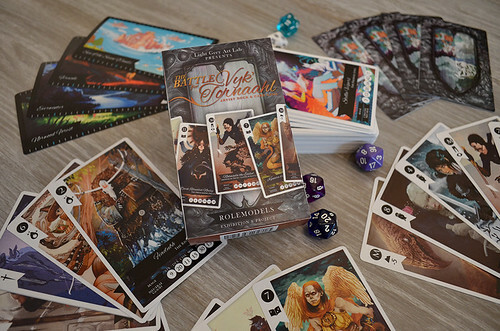 We are giving away 4 copies of the Battle for Vyk Tornaahl Card Game! Submit your info in the comments section below by Sunday, October 20th! 1. In the comments section below, post your name, email and website (if you have one!) and you preferred RPG class! We will be creating some fun content based on your decisions! 3. Help us by sharing this blog post on twitter, tumblr, or otherwise with #LightGreyRoleModels and tell us where you shared it! ...and then we'll do a drawing using a random number generator and announce the winners on Tuesday, October 22nd! You are welcome to enter more than once : if you are interested in sharing more of your favorite artists, or care to share our post another day - but you can enter only once per day, and must share new creative role models, and re-post the blog entry. It will increase your odds of winning, but each person is only able to win once. In the event that we have a winner that can not attend the workshop we will bestow the VIP seat upon the runner up. Thanks for your help in telling us about your own role models & for assisting us in spreading the word of our biggest event of the year! You guys are amazing! Best of luck and please let us know if you have any questions!